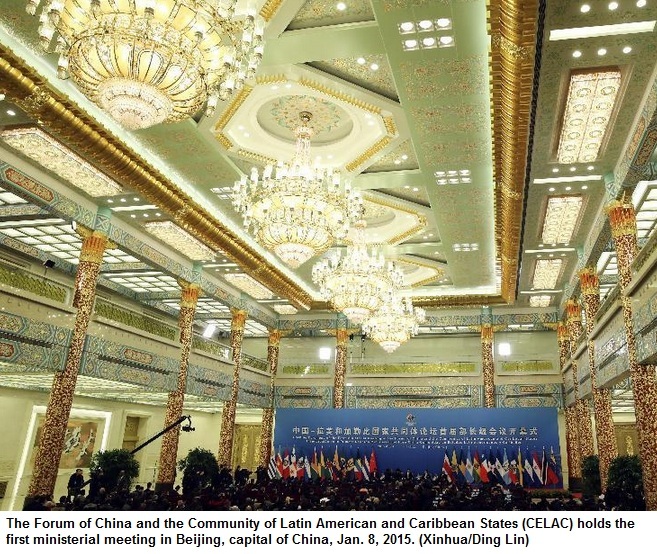 BEIJING- The first ministerial meeting of the Forum of China and the Community of Latin American and Caribbean States (CELAC) began in Beijing on Thursday, January 8, 2015. Chinese President Xi Jinping, Costa Rica President Luis Guillermo Solis, Ecuador President Rafael Correa Delgado, Venezuela President Nicolas Maduro Moros and Bahamas Prime Minister Perry Christie attended the opening ceremony of the two-day meeting at the Great Hall of the People in downtown Beijing. Established in December 2011 in Caracas of Venezuela, CELAC groups 33 countries, including all South American countries and some Caribbean states plus Mexico. During Xi’s visit to Latin America in July 2014, he and CELAC leaders announced the establishment of the cooperation forum and agreed to hold the first ministerial meeting at an early date. BEIJING- Chinese President Xi Jinping set the goal for bilateral trade between China and Latin American, Caribbean countries to reach 500 billion U.S dollars in 10 years. He made the remarks at the opening ceremony of the first ministerial meeting of the Forum of China and the Community of Latin American and Caribbean States (CELAC). He said China’s direct investment into Latin America will hit 250 billion U.S. dollars in the coming decade. China’s economy will continue medium to high speed growth in the coming period and provide more opportunities for the world including Latin American and Caribbean states, said the president. The goals were initially discussed during Xi’s visit to the region in July 2014. China-CELAC pragmatic cooperation has been expanded since the visit, Xi said, noting he is glad to see that a series of cooperation initiatives is being actively put into place. He said China welcomes active participation in cooperative projects with CELAC members. During last year’s visit, Xi and CELAC leaders announced the establishment of the China-CELAC forum. The Chinese president proposed a cooperation framework and several loans, funds and projects on infrastructure, agriculture, energy resources, manufacturing, high and new technology, people-to-people exchange and other fields. Established in December 2011 in Caracas, Venezuela, CELAC is a block of 33 countries, including all South American countries, some Caribbean states and Mexico.